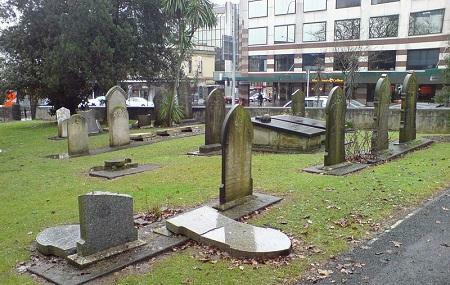 The Symonds Street Cemetery is a historic cemetery and is named after William Cornwallis Symonds- a prominent British Army officer during the early colonisation of New Zealand. The place has a few interesting pieces of tombstones and the cemetery is arranged by status and denomination. The trees that surround the place, shade the cemetery and add to its tranquillity. Take a walk around to see a part of Auckland’s history that resides peacefully in the city. People normally club together Waiatarua Reserve and Foxes Island Wines while planning their visit to Symonds Street Cemetery. Impressive cemetery, what is divided by bridge. Cemetery is divided in different sections and paths. Informative boards available, so you can learn more about history. One of New Zealands oldest 19th century inner city cemeteries. Ravaged in the early 1970s by the motorway.